Community swimming pools are located throughout Merced County. Programs include swimming lessons, recreational swimming, and pool rentals. A variety of local swim leagues provides the opportunity for youth to improve their swim skills and compete in swim meets. Scroll down to explore the possibilities. Recreational swimming is offered Monday through Friday from 1 to 4 PM and Saturday from 12 to 4 PM. Swim lessons for children are also available. For current information, including swim lesson schedules, call Atwater’s Department of Parks and Community Services at (209) 357-6320. We are offering 3 sessions: June 12 thru June 23, July 3 thru July 14 and July 17 thru July 28. We offer: 11am, 12am, 1pm,3pm, 4pm, 5pm, and 6pm classes each class is for one hour a day Monday thru Friday. Each session cost $45 per child. Located at Delhi High School, the Delhi pool offers recreational swimming, family swim nights, and swim lessons during the summer months. During the summer of 2016, the pool will be open from June 28th through August 6th. Swim hours are Tuesday through Saturday from 12 to 4 PM. Admission is $1. A special family swim night is offered every Friday, with the pool open from 5 to 7:45 PM. Admission on family swim nights is $0.75 per person. Location: Delhi High School, 16881 W. Schendel Road, Delhi. For more information, contact the Delhi Unified School District at (209) 656-2000. The pool at Dos Palos High School offers swimming lessons and recreational swim hours during the summer months. Location: Dos Palos High School, corner of Mabel Avenue and Palo Alto Street. For current information call City of Dos Palos Parks and Recreation at 392-2178. The Gustine Aquatics Center at Henry Miller Park offers the following programs during the summer months: water aerobics, open swim, night swim, and pool rental. For more information call Gustine City Hall at (209) 854-6471. The pool is open from 9 to 10 AM Monday through Thursday for adult lap swim. Open swim is held Monday through Friday from 12 to 4 PM. NIght swim is offered on Tuesday andThursday nights form 6 to 8 PM. Admission is $3/person or $2 for senior citizens. You can save money by paying in advance and for those who want to swim frequently, unlimited visit passes are available. Water aerobics and swim lessons are also offered - see the City of Gustine webpage for more information: http://www.cityofgustine.com/newsView.aspx?nid=2963. Located in the Hilmar Park, the pool offers swimming lessons, recreational swimming hours, water aerobics, and lap swimming. Location: Hilmar Park, corner of Lander Avenue and Falke Street. To sign up for swim lessons or for more information call the pool at 667-6947 between 1 and 4 PM on a weekday. and April 30 till June 9 for $125. FOR 2017 THE SWIMMING POOL IS CLOSED FOR CONSTRUCTION. For more information call Livingston City Hall at 209-394-8830. Swimming lessons and open swim hours are offered at the Los Banos County Park during the summer months. These pools are available to rent for private events. Swim lessons are offered for children of all ages starting with a “parent and me” class for toddlers as young as six months. Merced College offers a variety of swim programs during the summer and throughout the year. Call the city at 385-6978 for more information and current schedules. The City of Merced offers swimming during the summer at McNamara Park, Golden Valley High School, and Merced High School. Swim lessons are offered for children of all ages starting with a “parent and me” class for toddlers as young as six months. Merced College offers a variety of swim programs during the summer and throughout the year. Call the city at 385-6978 for more information, schedules, and to sign up. City of Merced Recreational Swim Programs: The Memorial Plunge at McNamara Park and the Golden Valley High School pool are available for recreational swimming on summer afternoons. The cost for admission - please call. Youth under age 18 swim free on Fridays at MacNamara Park. For more information, call the city at 385-6978. Rentals are available from May through August. Merced College Pool: Merced College’s Community Service Department provides recreation classes for all ages. Programs for children include swimming lessons, diving lessons, and water polo. Adult recreational lap swimming is offered throughout the year. For more information call (209) 384-6224. Merced College Pool: Merced College’s Community Service Department provides recreation classes for all ages. Programs for children include swimming lessons, diving lessons, and water polo. Adult recreational lap swimming is offered throughout the year. The Merced County Swim League is made up of ten teams from Merced County and surrounding communities. Merced is also home to the Merced Skimmers Swim Team, which practices regularly at Merced College. Skimmers offers youth programs and masters swimming for adults. The days are long and hot, and many of us – especially our kids – have extra time to get out and do things. Atwater has always celebrated Independence Day in a big way. That tradition continues this year with a parade, entertainment, food, bounce houses, a live concert, and a fireworks show. This year’s parade theme is “Back to the 80s” and celebrates the entertainment and events of that decade. For more information, go to http://www.atwater4thofjuly.com/. Gustine: This year’s Gustine’s parade will begin at 10:30 AM and will feature a flyover by the Flying Eagles, squadron VFA-122 from Lemoore Naval Air Station. The parade will be followed by activities for children in Henry Miller Park. Food and drinks will be available from a variety of food venders. The celebration will conclude with fireworks at Gustine High School after dark. Livingston offers live music, a fireworks show that is billed as the largest in the valley, a carnival, and a car show. The events stretch from July 1st through 4th. For more information, go to http://livingston4thofjuly.com/. Merced Shakespearefest ‘s performance of Love’s Labor Lost in Applegate Park in September. The show is free and open to all. For more information go to: http://www.mercedshakespearefest.org/index.htm. Guided whitewater trips: The Merced and Tuolumne Rivers provide some of the best rafting in the state. Rafting these rivers is an unforgettable experience, full of thrills and excitement. The following companies lead trips of various lengths and difficulty levels. The Tuolumne River can usually be rafted all summer, while the Merced River is more dependent on the amount of snowmelt and the rafting season often ends in July. Stanislaus River raft and tube rentals: Starting at the historic town of Knights Ferry, a 6-mile stretch of the river can be easily floated without a guide. Two companies rent rafts, oars, and life jackets. Rafts can accommodate entire families and it is an adventure that any age can enjoy. The raft companies provide transportation back to Knights Ferry after you have completed your float down the river. Hagaman and Henderson are both situated on the Merced River. Lake Yosemite wraps around the southern side of a reservoir just outside the City of Merced. Henderson is my personal favorite with the nicest facilities and plenty of shade provided by tall trees. Note: pets are not allowed in Merced County Parks, but are welcome in California State Parks and at reservoirs operated by local irrigation districts and the Army Corps of Engineers. Located on a bluff above the Merced River in northwestern Merced County, Hagaman Park is especially popular with residents of the west side of the county. A large picnic area is available for rent. Because of drownings, this area is not open to fishing and a fence runs along the bluff to discourage river access. If you want to swim or fish in the Merced River, try Henderson County Park, George J. Hatfield State Recreation Area, or McConnell State Recreation Area. Nearby Parks: Camping and picnic areas are available at George J. Hatfield State Recreation Area, McConnell State Recreation Area, and San Luis State Recreation Area. 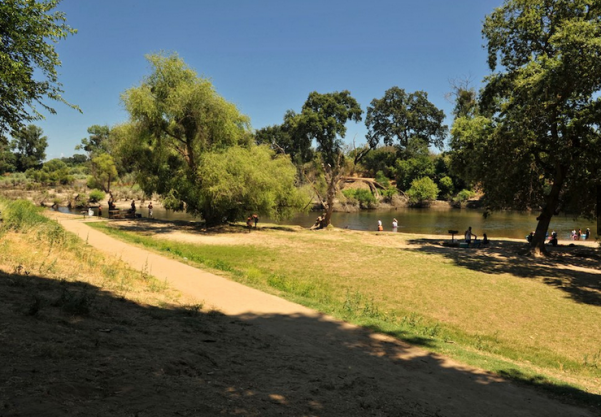 Stretched along the bank of the Merced River in eastern Merced County, Henderson Park is shaded by tall trees and further back from the road than the facilities at Hagaman County Park or George J. Hatfield State Recreation Area. Like McConnell State Recreation Area, it feels more distant and removed than it actually is. The park is popular for picnicking, large gatherings, river recreation, and fishing. Three rental facilities are available, including an indoor clubhouse with kitchen and fireplace. Fishing and boating: Fishing for rainbow trout is popular along the river and small boats can be hand launched from a concrete ramp (vehicles are not permitted near the ramp). Nearby Parks: Camping is available at McConnell State Recreation Area, and Lake McClure and Lake McSwain. Only seven miles from the center of Merced, Lake Yosemite has long been a popular spot for picnics, family outings, group activities, fishing and boating. It isn’t the largest lake in Merced County, but it is close to home and has extensive recreational facilities. Most facilities are accessed from Lake Road, but a secondary fishing access point is located at the end of Old Lake Road. Lake Yosemite’s water comes from the Merced River. It is diverted into the Main Canal by the Crocker-Huffman Dam, halfway between Snelling and Merced Falls. Fish species: Bass, bluegill, and catfish. Trout are stocked in the early spring, but don’t last through the summer because of water temperatures. Rentals: Non-motorized boats are available on summer weekends from the concession stand. Nearby parks: The closest camping is available at McConnell State Recreation Area, and Lake McClure and Lake McSwain. Recreation organizations: The Lake Yosemite Sailing Association organizes sailboat events and races, maintains a docking area, and teaches sailboating skills. Membership is open to all who have an interest in sailing. George J. Hatfield State Recreation Area: This state park has a mile of river frontage and plenty of shade. It’s proximity to the road and the poor condition of some of its facilities make it less favorable than some of the other parks on the river, but it still provides many excellent fishing opportunities. Near the park is a historic bridge over the Merced River. Built in 1910, it is now open only to pedestrians and bikers. It provides nice views of the river. Fishing or boating? Fishing can be good at George J. Hatfield Recreation Area. Rainbow trout and bass can be caught in the spring; catfish and perch throughout the year. No boating ramp is provided, but it is possible to swim in the river or to launch a float tube or hand-carried boat. Nearby Parks: Undeveloped Great Valley Grasslands State Park has a six mile hiking trail. Great Valley Grasslands State Park: This park preserves one of the few remaining examples of Central Valley grassland. The primary attraction of this undeveloped park is a six mile loop trail along levee roads. Along this route you can see, the San Joaquin River, native bunchgrass prairie, and vernal pools. Fishing or Boating? No boat ramps are provided, but float tubes could be launched in the San Joaquin River. Bass and catfish are the primary species caught in this area. Nearby Parks: Camping and picnic areas are available at George J. Hatfield State Recreation Area, McConnell State Recreation Area, and San Luis State Recreation Area. Picnic areas are also available at Hagaman County Park. McConnell State Recreation Area: Like the other Merced River Parks, McConnell has a lot of shade. It’s also a bit more developed than Hatfield and further from the highway. If I were to pick a Merced River park in the Valley to camp at, this would be it. Fishing or boating? Fishing can be good at McConnell Recreation Area. Rainbow trout and bass can be caught in the spring; catfish and perch throughout the year. No boating ramp is provided, but it is possible to swim in the river or to launch a float tube or hand-carried boat. Pacheco State Park: This park preserves part of a large Mexican land grant given to the Pacheco family in 1843. 28 miles of trails are available for hiking, biking, and equestrian use. Thousands of acres of gently rolling oak woodland produces spectacular wildflower displays in the spring. The ruins of the Pacheco Adobe and a well-preserved line shack from Henry Miller’s ranching operation stand near the picnic area. Location: 38787 Dinosaur Point Road, Hollister, CA. Accessed from Highway 152. Website: http://www.parks.ca.gov/?page_id=560 and http://www.parks.ca.gov/pages/560/files/Pacheco.pdf. See http://www.parks.ca.gov/pages/560/files/PachecoTrailMap2006small.pdf for a trail guide. Special Events: Ranger-led wildflower hikes in the spring. A kite flying day is also held annually. The San Luis State Recreation Area is made up of three units. San Luis Reservoir is the largest and is used primarily for fishing. Part of both the California Aqueduct and the Central Valley irrigation projects, it is the largest off-stream reservoir in the United States. At full capacity, it measures nine by five miles at its widest points. The O’Neill Forebay, a smaller lake below the San Luis Dam, is open to all kinds of recreation and offers the best fishing in the area. Although this area can be windy, the O’Neill Forebay is more sheltered than the San Luis Reservoir. 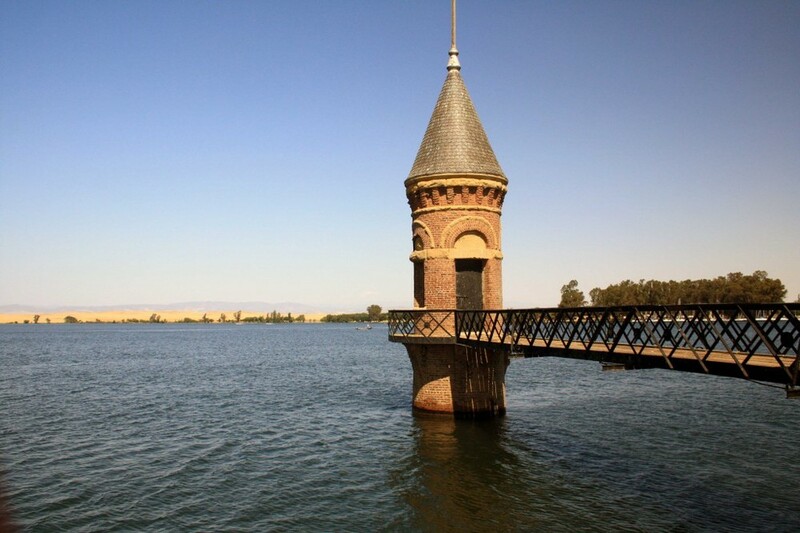 O’Neill Forebay is considered to be one of California’s premier fishing areas. The State record striped bass was caught in O’Neill Forebay in 2008. It measured 52.5 inches and weighed 70.6 lbs. 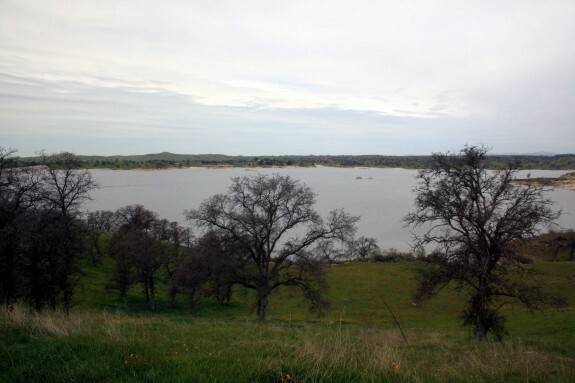 Los Banos Creek Reservoir, located a few miles to the south, receives much less visitation. It is best-known for springtime ranger-led hikes along the creek in the spring. 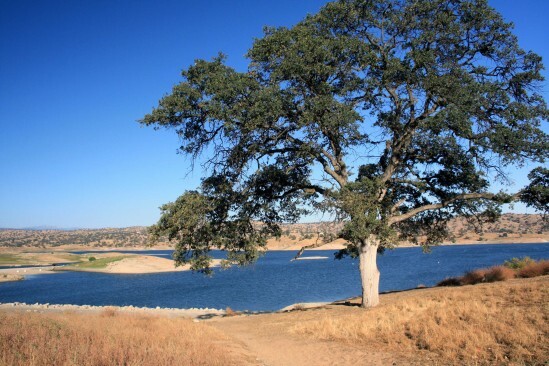 With a 5mph speed limit, Los Banos Creek Reservoir is primarily enjoyed by anglers. A shoreline trail is provided for fishing access. 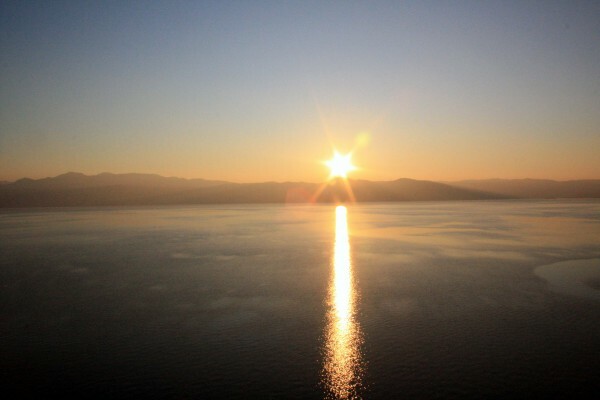 Location: San Luis Reservoir and the O’Neill Forebay are located on Highway 152, a few miles west of I-5. Additional access is available from State Highway 33. Los Banos Creek Reservoir is located on Canyon Road, southwest of Los Banos and I-5. Horses allowed? Yes, and many equestrian trails are available at the adjacent Pacheco State Park. Los Banos Creek Reservoir: bass, bluegill, catfish, and crappie. Trout are stocked in the early spring, but don’t last through the summer because of water temperatures. Special events: O’Neill Forebay hosts a Kids Fishing Day in the spring. The popular Path of the Padres is a Ranger-led hike along Los Banos Creek that is offered from February through April. Hikers enjoy a creekside walk through wildflowers and learn about the history, wildlife, and plant species of the area. 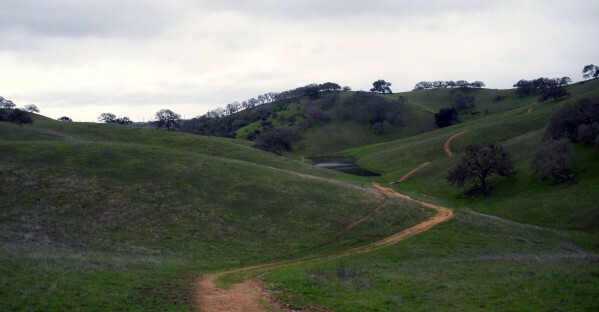 Nearby parks: Pacheco State Park is adjacent to San Luis Recreation Area and offers hiking and equestrian trails. Ranger-led wildflower hikes are offered in the spring. The California Aqueduct Bikeway begins at San Luis Creek and goes 70 miles north to the Bethany Reservoir State Recreation Area with rest stops ten miles apart and chemical toilets. 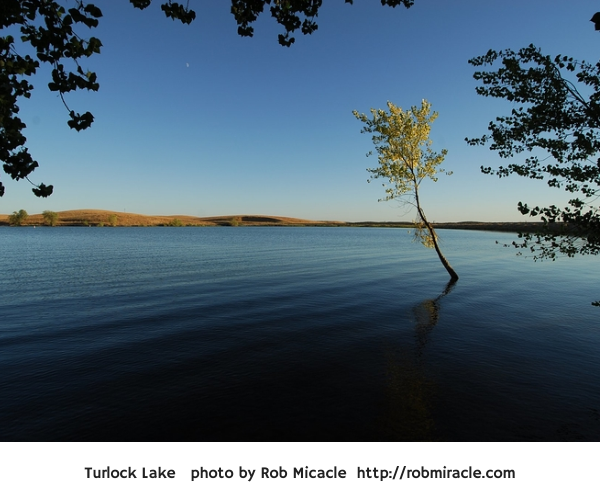 Turlock Lake State Recreation Area: Less than an hour from many points in Merced County, Turlock Lake large and easily accessible. The Merced is our local river and it can be a great place to fish or float. Because access points aren’t well publicized, this page is an attempt to provide some information about them. Starting in the high country of Yosemite National Park, the river flows westward for 145 miles before joining the San Joaquin near the town of Newman. The following is a list of access points in Merced County starting at the western end of the river and working east towards Mariposa County. Fishing is generally a safe river recreation as long as you do not wade out into the river.Swimming, boating, and floating the river on rafts or tubes are more hazardous activities.They are not recommended except in designated swimming sites such as the Hatfield and McConnell State Recreation Areas.Do not venture out into the river unless you are a strong swimmer, you wear a life jacket, you are sober, and you have a first aid kit and plenty of emergency supplies. If you’ve never floated a river before, find someone experienced to go with. The river has several rapids and places where rafters and boaters may be swept into trees and vines.There are also places where the river splits into multiple channels and it can be difficult to choose the safest route.High water flow, especially in the spring and after storms, may make the river extremely dangerous.Mid to late summer is usually the safest time to go, but this is not always the case. Rivers have dangerous underwater hazards that can snare and drown swimmers and boaters.Every year California’s rivers claim lives!Think carefully before getting in the river and observe any posted safety warnings. Some of the best online information about floating the river can be found at:https://www.americanwhitewater.org/content/River/detail/id/5042/. George J. Hatfield State Recreation Area: Located near the river’s confluence with the San Joaquin, this state park offers the last access point to the river.Camping, picnicking, fishing, wading, and swimming are all permitted.Located at 4394 North Kelly Road which is technically in the town of Hilmar, the closest population center and supplies is actually Newman. For more information go to http://www.parks.ca.gov/?page_id=556. You can also call the park office at (209) 826-1197 for more information. The signs posted by Merced County at Hagaman Park tell visitors that they should stay out of the river, but the brochure produced by California State Parks to provide information about its two parks along the river (Hatfield and McConnell) lists it as one of the places you can take your raft or canoe out of the river if you are floating it. The result is confusion.I don’t recommend Hagaman Park as a place to access the river, but if you are interested in doing so, contact Merced County Parks and Recreation first: (209) 385-7426. You can also find park information at http://www.co.merced.ca.us/index.aspx?NID=1410. This state park offers camping, picnicking, and some of the best access for fishing, wading, and swimming on the lower river.Located off El Capitan Way at the end of McConnell Road, the closest population centers and supplies are Delhi and Livingston. For more information, go to http://www.parks.ca.gov/?page_id=554. You can also call the park office at (209) 394-7755 for more information. Oakdale Road Bridge:There’s plenty of parking near the bridge and you can walk across the original 1912 bridge (now only open to foot and bike traffic), but the potential river access points are signed “No Trespassing.”It’s clear that some people do access the river here, but you’re liable to citation for trespassing if you do. Highway 59 Bridge: Although official signs at this location delineate the fishing regulations for this part of the river, the landowner has informed me that any access at this point will be considered trespassing. Don’t access the river at this location." Snelling Road Bridge:Like the Highway 59 Bridge, land on both sides is private, but access has been allowed from the corridor along the highway.If you access the river here, be aware of all posted signs which may limit access in the future.The bridge is located on Snelling Road, 0.7 miles south of the junction with Highway 59. I’ve talked to a lot of people who have fished the river at the end of 3rd Street in Snelling, but there are currently “No Trespassing” signs posted.If you visit, check the signs before you access the river. This area is accessed by turning south on 3rd Street (near the Chevron gas station) and following the road for a short distance.It becomes a rough dirt road near the river. This county park is located 1 mile east of downtown Snelling on Merced Falls Road.It offers picnic areas, playgrounds, and plenty of river access.Signs warn visitors about the dangers of river access, but do not prohibit it. or call (209) 385-7426. This is one of the most picturesque spots on the lower river. A $3/car entry fee is charged on weekends and holidays. First access point east of Snelling: Set your odometer to zero at the intersection of 3rd Street and Highway 59 in Snelling. 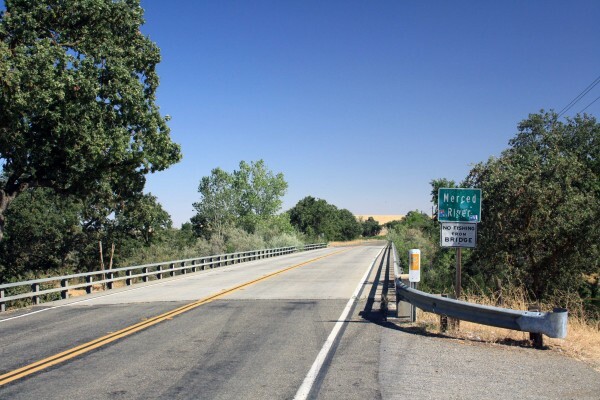 Highway 59 becomes Merced Falls Road at the junction with County Highway J59. The second access point to the river is 1.6 miles beyond 3rd Street and Highway 59. After you pass the J59 junction and Henderson Park, look for the first yellow sign indicating a left curve. There is a small parking area and a sign indicating fishing regulations on the right side of the road. MID Cuneo Access:Located at mile 2.5, you will see a sign, a fenced gravel parking lot, and a restroom. The river is a short walk from the parking area along a trail.This access point may be closed seasonally, even when fishing is allowed. Access between Cuneo and Crocker Huffman:At mile 3.3 begins a series of parking areas along the bank of the river to mile 3.6. The first one is located by an electrical pole and mailboxes for 5706 and 5996 Merced Falls Road. The parking areas end across from a sign indicating the entrance to 5996 on the left side of the road.These areas have been “No Stopping Any Time,” since Summer 2014 due to litter and traffic problems.According to Merced County, you can stop briefly to drop off fishing gear or rafts, but then must move your vehicle beyond the signs. MID is currently constructing a new parking and access area that should be opening just east of this access point.The estimated opening date is sometime later in 2015. MID Crocker-Huffman Fishing Access:After a 40 mph curve, you’ll see a fenced gravel parking lot and a sign indicating MID ownership at mile 4.1. If you pass A-1 Bait and Tackle, you’ve driven too far. A hike of about ¼ mile from the parking area will take you to the dam. Note that fishing regulations are different for the area above the dam and the area below. Consult the DFG’s fishing regulations to make sure that you are in compliance.This access point may be closed seasonally, even when fishing is allowed. PG&E River’s Edge Fishing Access:This access point is 6.2 miles beyond Snelling, next to the PG&E hydroelectric plant. This access point allows you to fish above the spillway of the Merced Falls Dam. Note that swimming, float tubes, and boats are not allowed because of the proximity to the dam. Hornitos Road Bridge Area:After Merced Falls Road turns sharply north, make a right turn on Hornitos Road. Turn again when the road splits for Lakes McSwain and McClure (left) and Hornitos Road (right). There are a number of places to park near the bridge. This area is 6.4 miles from 3rd and Highway 59 in Snelling. This is a popular place to fish from the shore or to launch float tubes or canoes. PG&E Lake McClure Road Access:7.2 miles east of Snelling on Lake McClure Road, a right hand turn just before you reach the entrance gate to Lake McSwain and Lake McClure Recreation Area leads to another PG&E access point directly below the Lake McSwain Dam. Beyond the McClure Road access point, the river is a part of Lakes McSwain and McClure. It becomes a free-flowing river again at the eastern end of Lake McClure where it is crossed by the Highway 49 Bridge.There is no road along the next 8.4 miles of the river.A very rough trail follows it (washed out on the Highway 49 side) but you can follow it cross-country on the northern side of the river until it becomes a true trail again.The eastern side of the trail is accessed from the end of the Briceburg Road. There is no bridge across the confluence of the North Fork of the Merced, which can only be waded safely in low water conditions.The Briceburg Road follows the next 5 miles of the river beyond the trail up to where it joins Highway 140.From that point onwards, Highway 140 parallels the river closely into Yosemite National Park. There are many views of the river from the road and many places to fish.Floating the river above Lake McClure is not recommended as there are many dangerous class III-IV rapids and a small waterfall near the confluence of the North Fork. From the end of the road in Yosemite, trails follow the river past Vernal and Nevada Falls to its sources in the wilderness of the park. 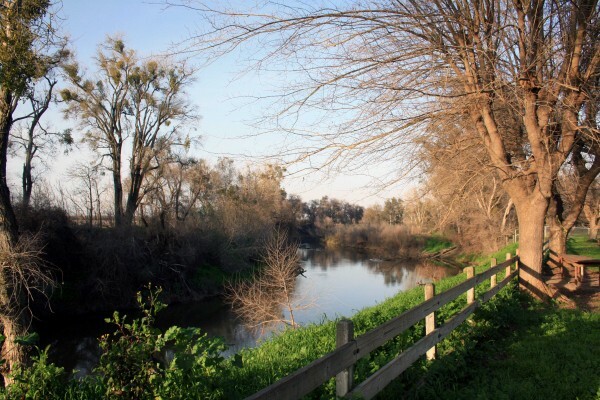 Avoiding Trespassing:The safest spots for legal river access in Merced County are Hatfield, McConnell, Henderson, and the access points maintained by MID and PG&E. The others are privately owned, but have not been posted or fenced in the past (this is always subject to change). This seems to indicate that the landowner is allowing access, however you may risk trespassing if you access the river at these points. Make sure you pack out your garbage and do anything you can to help keep these areas clean. Fishing Regulations:Make sure you check fishing regulations for the area in which you plan to fish:http://www.dfg.ca.gov/. They change at the Crocker Huffman Dam.Although they are usually posted at the areas between the dam and the Highway 59 Bridge, conditions are always subject to change and may not be posted. Romero Visitor Center – San Luis ReservoirDrivers heading out of Merced County over Pacheco Pass often notice the sign for the Romero Visitor Center at the San Luis State Recreation Area and wonder what it is. For several years I did this – always on my way to get somewhere else. Finally last month I stopped to check it out. Located at the top of the long span of Sisk Dam, the visitor center has exhibits about the history of the area, the construction of the dam, and California’s massive water storage and delivery system. Tours are available and a variety of films about water in California can be shown upon request. If you’ve ever wanted to know more about water use and management in the Golden State, this is a great place to start. Open from 9AM to 5 PM daily (except major holidays), it is an easy and relatively quick stop on your way to somewhere else. Better yet, admission is free. While you are there you can learn about recreational opportunities at the San Luis State Recreation Area and other recreation areas within the California State Water Project System from the Department of Water Resources guide on duty. Although most of the visitor services within the San Luis SRA are operated by California State Parks, the Romero Visitor Center is operated by the California Department of Water Resources. The reservoir was constructed between 1963 and 1967. Part of both the State Water Project and the Central Valley Project, the reservoir holds water from the Sacramento-San Joaquin River Delta before it is delivered throughout the state via the California Aqueduct and the Delta-Mendota Canal. This redistribution of the state’s water is part of what makes modern California and possible. In a state where much of the land is desert (less than 10 inches of precipitation annually) or semiarid (less than 20 inches annually), water management is tremendously important to support a population of 38 million inhabitants, plus agriculture, industry, commerce, recreation, tourism, and wildlife. 385-foot tall rock and earthfill Sisk Dam forms the fifth-largest reservoir in California. Holding 652 billion gallons of water when full, the lake is only surpassed in size by Shasta, Oroville, Trinity, and New Melones. It is also the largest off-stream reservoir in the United States. Rather than stopping the flow of a river along its natural course, an off-stream reservoir holds water that has been pumped away from its natural location. With this year’s worrisome dry winter, it’s a great time to increase your knowledge of this precious and scarce resource. Although the reservoir is currently near full capacity after last year’s exceptional winter, it may soon be returning to the low levels that were so common a couple of years ago. Now is the time to enjoy the beauty of the reservoir. For optimal viewing, pick a day with clear skies and clean air. If we continue to get precipitation the hills may be very green by March and April. Great wildflower shows are common after wet winters. From the patio behind the visitor center, visitors can use free telescopes to view the lake and the surrounding hills. If you’re lucky, the area’s herd of native tule elk may be within sight. On my recent visit they were grazing close to the dam. Less than an hour from many points in Merced County, Turlock Lake large and easily accessible. Yosemite National Park is surrounded by national forest lands. To the northwest, the Stanislaus National Forest provides some of the closest mountain recreation for those of us in the Central Valley. On the opposite side of the Merced River, the Sierra National Forest provides equally close mountains. When you drive to Yosemite on Highway 140 you are on the Sierra National Forest side of the river canyon for most of the journey. Directly across the water is Stanislaus National Forest. The name “Sierra National Forest” can be confusing because the Sierra Nevada mountain range stretches all the way from Highway 36 east of Chico to Tehachapi Pass (Highway 58) in the south. Sierra National Forest comprises only part of this area – specifically the area between Yosemite National Park and Kings Canyon National Park. Its 1.3 million acres of land provide just about every type of outdoor recreation imaginable. From dry foothills to snowbound windswept peaks it is a glorious place to explore. Just as with its vast northern neighbor Stanislaus National Forest, the question “What do you do there?” requires a long answer. This article is an effort to answer that question and to provide a list of useful resources for learning about the forest and its recreational opportunities. Within the forest there are many privately owned areas. Some of these offer additional recreational opportunities plus tent and RV campgrounds, lodging, restaurants, stores, and gas stations. The Sierra National Forest Headquarters is located at 1600 Tollhouse Road in Clovis. You can get general forest information and recreation permits by contacting the headquarters. 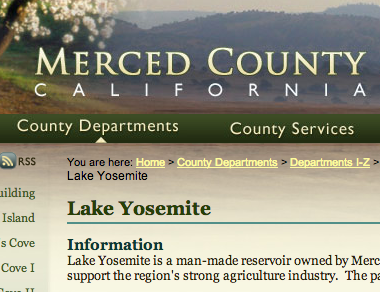 The phone number is (559) 297-0706 and the general website for the entire forest is www.fs.usda.gov/sierra/. Unlike the national forests to the north, no road crosses the entire mountain range within Sierra National Forest. Highway 168, the major state highway in the area, penetrates deep into the mountains and the Kaiser Pass Road to Edison and Florence Lakes approaches the crest, but there is no automobile crossing. This leaves plenty of room for exploration on foot or horseback. A number of secondary roads ranging from two-lane paved roads to rough four-wheel drive roads provide plenty of additional access. Besides Highway 168 and Kaiser Pass Road, the paved roads to Courtright and Wishon Reservoirs are great scenic drives. The partially-paved 100-mile Sierra Vista Scenic Byway is also a great choice for auto touring. Usually the road can be traversed by any car if driven carefully, but high-clearance is recommended. The major supply and service locations are adjacent to the major roads. Each of the major routes has chambers of commerce and/or business associations with websites for information about lodging, food, supplies, gas, local activities, and special events. Five wilderness areas are within or partly within the boundaries of Sierra National Forest. They offer some of California’s best hiking, backpacking, and fishing. They are also great places to enjoy abundant and brilliant wildflowers and to see a variety of wildlife in its natural habitat. Named for the photographer whose timeless images turned the Sierra Nevada’s striking landscapes into universally-recognized icons, this great wilderness area makes up much of the northeastern section of Sierra National Forest. With stunning mountain peaks, alpine lakes, and the headwaters of the San Joaquin River, the Ansel Adams Wilderness has a lifetime of trails to explore. One of the smaller wilderness areas in the forest, this often-overlooked region has many lakes and surprisingly easy day hike and backpacking destinations. Note: the lakes are not “dinkey” in size; the wilderness was named for a dog named Dinkey who saved a pioneer from a grizzly bear attack. The protection of the Sierra Nevada Mountains is largely due to the work of naturalist John Muir and it is only fitting that one of the largest wilderness areas in the range bears his name. 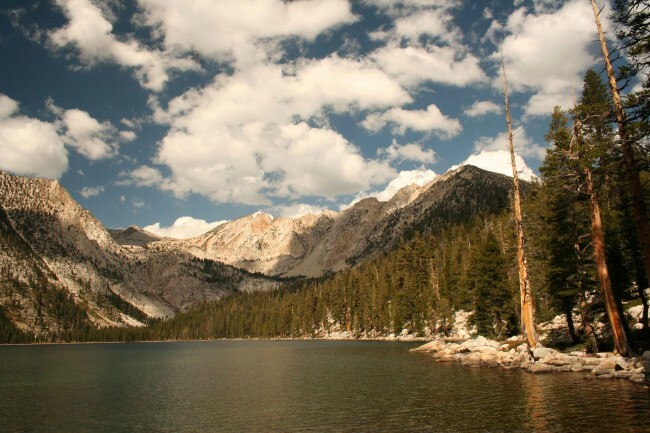 The eastern part of the wilderness is part of Inyo National Forest. This area contains some of the highest peaks in the lower 48 states, glaciers, an amazing number of lakes, and excellent fishing. This is a small wilderness area that is largely unknown outside the Fresno area. Centered around Kaiser Peak and north of Huntington Lake, the area contains several small lakes. Trails are generally more challenging than the equally-sized Dinkey Lakes Wilderness. At the southernmost edge of Sierra National Forest, this small and almost unknown wilderness is mostly located within Sequoia National Forest and the Giant Sequoia National Monument. Although it lacks lakes and contains some extremely rugged terrain it is a place where solitude is likely to be found among old growth giant sequoias. On the northern edge of the forest north of Oakhurst, this partially-logged grove still has several impressive trees. Located along the McKinley Grove Road between Dinkey Creek and Wishon Reservoir. An easy walk through the trees is a trail that is within just about anyone’s ability range. Although web-based resources are great for planning a trip, cellular service, internet, and electric power are hard to come by in much of the forest. If you can store electronic resources on your device and have well-charged batteries, you may be able to continue to access your information this way. It’s always good, however, to have some paper resources. Print out information from the internet and bring both maps and books. The general guide produced by Sierra National Forest is invaluable to have with you, especially if your plans change while on a trip. Weather and other elements outside of your control often require flexibility. Unfortunately there is no single book that comprehensively covers this area. For backpacking, Sierra South from Wilderness Press is a great choice. For shorter day hikes, pick up a copy of California Hiking by Stienstra and Brown. Not only does this book highlight the best day hikes in Sierra National Forest, it is also an excellent resource for the entire state with a total of 1,000 hike routes. Hiking the Sierra Nevada by Barry Parr is also a good choice. It’s good to have a general highway map, but if you plan to explore off the main roads the Sierra National Forest Map is one of the most important things to have with you. In addition to roads and trails, it also shows campgrounds, ranger stations, supply locations, and recreation areas. It supplements the general guide to the forest (see above). You can buy it from the U.S. Geological Survey for $12: store.usgs.gov from a variety of other online retailers. You can also purchase it at a ranger station. For hiking or backpacking, the following maps are the top choices: No matter what resources you use, always call a ranger station to verify current conditions before you leave on a trip. Conditions are always changing and even the official websites can be badly out of date. (I generally prefer Tom Harrison’s maps because they have the mileage directly written on each trail segment – this makes for easier trip planning. They are also waterproof). For more detailed hiking maps, check the USGS website for 7.5 and 15 minute sections. You can order printed copies of these maps or download free electronic copies. Within Sierra National Forest you’ll find 82 campgrounds. Some campgrounds are reservable in advance. You can search for reservable campsites by going to: www.recreation.gov. Camping outside a campground (usually referred to as “dispersed camping”) is permitted in areas of the forest where signs do not specifically prohibit it. You can always check with a ranger station before you set up camp. In order to have a campfire you need a California Campfire Permit, available at any ranger station. As long as you follow the rules on the permit and make sure that you have chosen a safe site, your campfire is legal. Before your trip you should also make sure that additional campfire restrictions have not been put in place. In dry years campfires are sometimes prohibited outside of established campgrounds. This year is no different and some limitations have been imposed. A variety of programs and hikes for all ages and ability levels are offered throughout the year. For current schedules call the ranger district that you plan to visit. The forest abounds with streams, rivers, natural lakes, and reservoirs. Many are stocked and most are open to fishing. For regulations and stocking information, go to www.dfg.ca.gov. Tom Stienstra’s California Fishing is a good general guide to the whole state, including Sierra National Forest. Motorized fishing boats area allowed on the following lakes: Bass, Courtright, Edison, Florence, Huntington, Mammoth Pool, Pine Flat, Redinger, Shaver, and Wishon. Water skiing and jet skis are allowed at Bass, Huntington, Pine Flat, Redinger, and Shaver. Swimming is allowed in most streams, rivers, and lakes, however it can be dangerous. Make sure that all people in your group have strong swimming abilities and you have flotation devices in case a rescue is necessary. Check with a ranger for current conditions and recommended areas. Dogs are welcome on trails and in campgrounds in national forests as long as they are on-leash and well-behaved. They are not permitted on trails in state or national parks. Dogs may be off-leash as long as they are under voice control within wilderness areas (except in bighorn sheep habitat areas – check with a ranger station if you are planning a backpacking trip with a dog). If you are not up to carrying all your gear or if you want to enjoy the wilderness with in a less strenuous way, a pack trip is a good choice. All roads and most trails outside of wilderness areas are open to mountain bikes. Check with a ranger for recommended trails and roads. Many remote forest roads require 4-wheel drive and several areas are open to off-highway vehicles. A copy of the Sierra National Forest map is extremely helpful in locating the best sites. The forest, including wilderness areas, is open to hunting according to DFG regulations. You can check regulations at www.dfg.ca.gov. Target shooting is prohibited in wilderness areas. Some roads and campgrounds are open through the winter months, especially in the lower elevations. Always carry tire chains and know how to install them. Highways 41, 140, and 168 are open throughout the winter except for temporary snow closures. Most other roads are closed. Many lodging facilities are open year-round. Sierra National Forest is also a popular destination to play in the snow. Five “Sno-Parks” offer snow recreation for a $5 use fee. Permits must be purchased before you reach the Sno-Park. Look for signs as you drive up Highway 168 or call the ranger station for a current listing. Along trails is also popular. Occasionally ranger-led snow activities are offered. Check with the ranger station for details. If none are offered, try Yosemite or Sequoia National Parks. To find your own route, pick up a copy of Best Snowshoe Trails of California by Mark White. or call the ranger station. Like McConnell State Recreation Area, it feels more distant and removed than it actually is. The park is popular for picnicking, large gatherings, river recreation, and fishing. Three rental facilities are available, including an indoor clubhouse with kitchen and fireplace. Fishing for rainbow trout is popular along the river and small boats can be hand launched from a concrete ramp (vehicles are not permitted near the ramp). This state park has a mile of river frontage and plenty of shade. It’s proximity to the road and the poor condition of some of its facilities make it less favorable than some of the other parks on the river, but it still provides many excellent fishing opportunities. Near the park is a historic bridge over the Merced River. Built in 1910, it is now open only to pedestrians and bikers. It provides nice views of the river. Just down the street from UC Merced....enjoy the beauty! 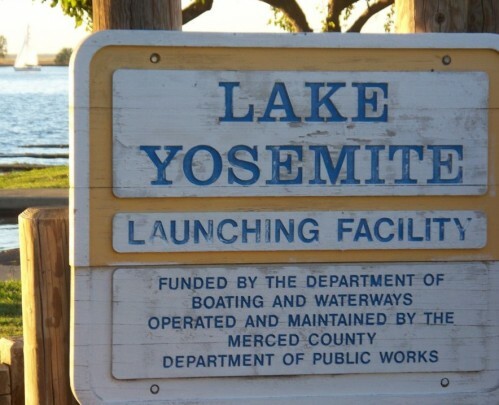 Only seven miles from the center of Merced, Lake Yosemite has long been a popular spot for picnics, family outings, group activities, fishing and boating. It isn’t the largest lake in Merced County, but it is close to home and has extensive recreational facilities. Most facilities are accessed from Lake Road, but a secondary fishing access point is located at the end of Old Lake Road. It is diverted into the Main Canal by the Crocker-Huffman Dam, halfway between Snelling and Merced Falls. Surface area of lake: 500 acres. The Lake Yosemite Sailing Association organizes sailboat events and races, maintains a docking area, and teaches sailboating skills. Boat ownership is not required and new members can learn to sail by crewing on boats owned by other members. Lake McSwain and Lake McClureLake McSwain and Lake McClure: These two sister reservoirs on the Merced River are operated as a unit by the Merced Irrigation District. Both provide excellent fishing. Lake McSwain may be tiny in comparison to Lake McClure, but sometimes has better trout fishing. Gigantic Lake McClure is especially popular for waterskiing, wake boarding, and houseboats. A 15-mile trail between the Bagby Recreation Area (Highway 49) and Briceburg (140) provides good river fishing, hiking, and mountain biking. Less visited than nearby Eastman Lake, Hensley Lake has almost as many facilities and comparable fishing. Hensley Lake was created by a dam on the Fresno River. Fish species: Bass, bluegill, catfish, crappie, sunfish. Rainbow trout during winter months. 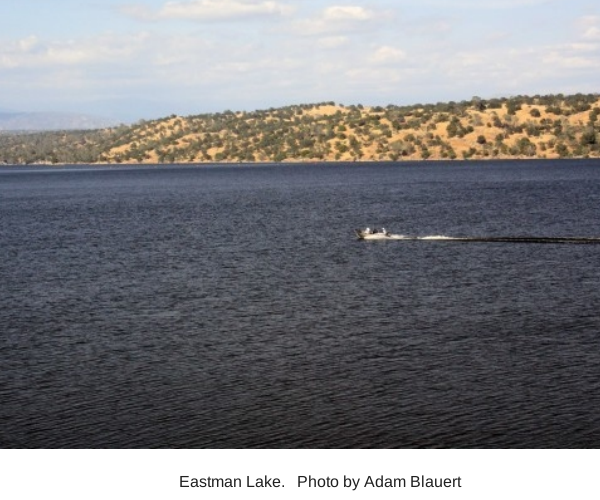 Eastman Lake: Formed by a dam on the Chowchilla reservoir, this tends to be more popular than nearby Hensley Lake. Yes - a large network of equestrian trails and an equestrian campground are available. Bass, bluegill, catfish, crappie. Rainbow trout during winter months. Encircled by the reservoirs of the Central Valley’s irrigation system, Merced County is a hub for boating, fishing, and water recreation. From the foothills of the Sierra Nevada on the eastern side of the county to the Diablo Range on the west side, there are eleven lakes within an hour’s drive of all communities in the county. Few counties have so many highly-rated areas for boating and fishing. Running east to west across the county, the Merced River has many access points for fishing. Portions of the San Joaquin, Chowchilla, and Fresno Rivers also flow through the county. The Tuolumne and Stanislaus Rivers lie just outside the county’s borders. While a boat is necessary to access some of the best fishing areas, there are also many lesser-known locations to fish from the shore of a river or lake. Most reservoirs and river access points offer camping, picnicking, swimming, and other recreational activities. Spring and fall usually have the most comfortable weather. Swimming, waterskiing, wakeboarding, and other kinds of water recreation are enjoyed during the hot months of summer. Click on any of the reservoirs or river access points listed below for more details on that area. Links to websites maintained by each recreation area are provided for additional information, regulations, campground reservations, and contact information. All kinds of boat and water recreation are allowed at these reservoirs except at Los Banos Creek Reservoir where a 5 mph speed limit keeps the lake calm for fishing. Please know and adhere to the speed limits posted at other lakes. The best river fishing in Merced County is along the Merced River. The river was named Rio de Nuestra Senora de Merced by a Spanish expedition in 1806. The current name and the name of the county were derived from this original name. Running 112 miles from Merced Lake in the high country of Yosemite National Park, the river empties into the San Joaquin River at Hill’s Ferry in the northwestern corner of Merced County. From Merced Lake, the river cascades down Nevada and Vernal Falls, and then through the entire length of Yosemite Valley. It is joined by smaller North and South Forks in the steep river canyon between Yosemite Valley and Lake McClure. 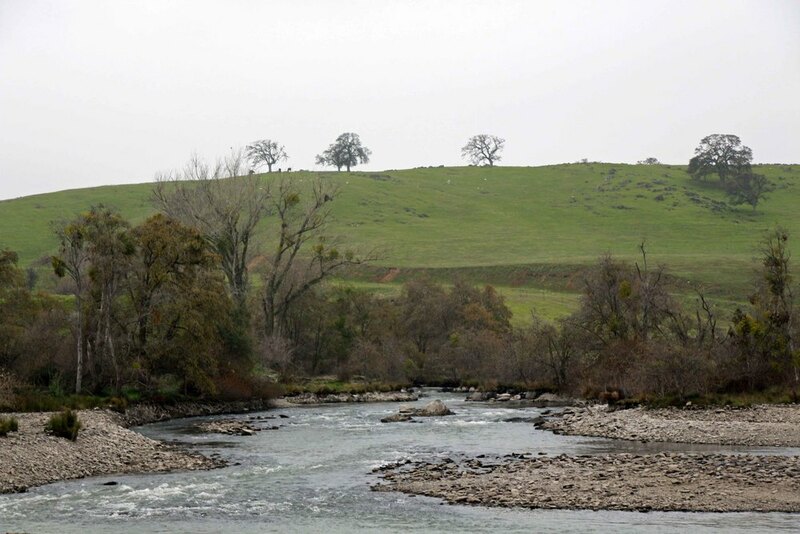 The river is dammed by New Exchequer Dam at Lake McClure, McSwain Dam at Lake McSwain, a dam at Merced Falls, the Crocker-Huffman Dam between Merced Falls and Snelling, and several smaller dams.The river’s flow depends on the previous year’s snowfall. Between Snelling and Hill’s Ferry the river is often slow and meandering, but it’s glassy surface can hide a strong current underneath. Exercise extreme caution if venturing into the river. In the upper regions Class IV and III rapids are common and the current can be overwhelming, even in the lower areas. Submerged hazards and deep holes in the channel of the river are not uncommon. Every year unprepared swimmers drown in the river. 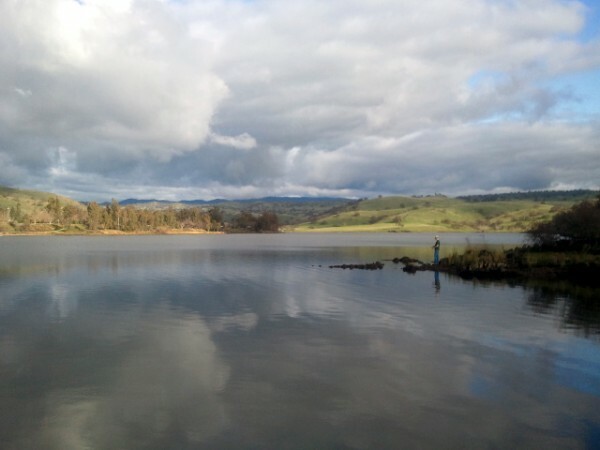 O’Neill Forebay and Don Pedro Lake are usually the highest-rated and most consistent fisheries in the area. Lake McClure, Lake McSwain and Modesto Reservoir also generally provide excellent fishing. Eastman Lake and Hensley Lake can be good when their water levels are high. George J. Hatfield State Recreation Area. 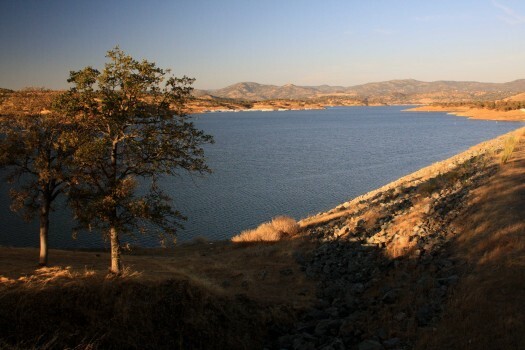 The fifth-largest artificial lake in California, Don Pedro is one of California’s highest-rated fishing areas. 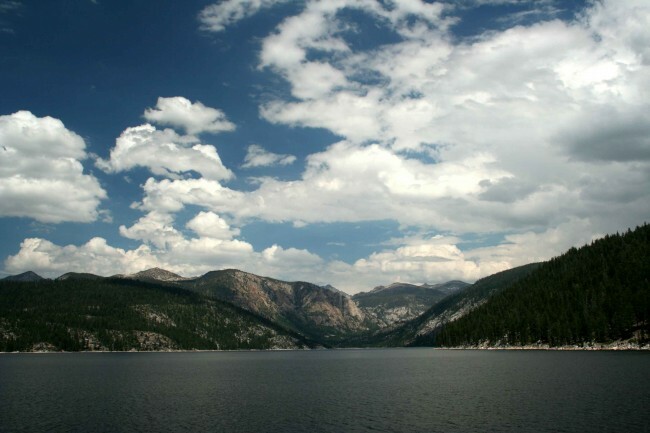 This Tuolumne River reservoir is also a prime area for all types of boat-based recreation. The spectacular 4th of July fireworks show draws huge crowds. Annual 4th of July fireworks show. This park preserves part of a large Mexican land grant given to the Pacheco family in 1843. 28 miles of trails are available for hiking, biking, and equestrian use. Thousands of acres of gently rolling oak woodland produces spectacular wildflower displays in the spring. The ruins of the Pacheco Adobe and a well-preserved line shack from Henry Miller’s ranching operation stand near the picnic area. Ranger-led wildflower hikes in the spring. A kite flying day is also held annually. If you’re looking for a place to cool off in the water, many areas will be more dangerous than usual. One of the places that you can go for some reliable water recreation on a summer afternoon is the ever-popular Rainbow Pool on the South Fork of the Tuolumne River. A short waterfall drops into the pool, providing a beautiful backdrop and keeping the water fresh. The parking area has been repaved, and access has been improved. Restrooms are provided and you can enjoy a picnic lunch between dips in the water. Rainbow Pool isn’t the kind of place where you are going to find a lot of solitude, but that’s part of what makes it a great place for families. There are generally plenty of people around should any kind of emergency occur. Your kids are likely to find others to splash and swim with. It’s lose to Highway 120 and easy to find – no wandering around on confusing dirt roads way back in the forest. To get to this swimming hole, drive 15 miles east of Groveland on Highway 120. Watch for signs on the right side of the road. Signs for Cherry Lake Road on the left side are another indicator that you are there. Turn right into the day use area and find a parking spot beneath the trees. The swimming hole is just a few steps down the hill. Traffic is routed through the parking lot in a one-way loop. Don’t be alarmed when the road takes you under the highway bridge and parallel with the highway on your way out of the lot. It will connect with the highway at the Cherry Lake Road. Located so close to Yosemite’s Big Oak Flat entrance, it’s a great place to stop on a Yosemite vacation. You can extend your trip by camping at a nearby campground. In fact, one of the best ways to enjoy a multi-day trip to Yosemite is to camp outside the park in one of the nearby campgrounds. While campgrounds inside the park are booked almost the moment that reservations become available and non-reserved sites are hit-or-miss, campgrounds outside the park boundaries are much better bet. You can check current conditions by clicking on each campground above. Watch for brown and white signs with tent icons along Highway 120 to find the campgrounds. All are operated by the US Forest Service and generally charge less than $25/night. Diamond O can be reserved in advance through www.recreation.gov, the federal government’s reservation service. I saw an angler catch a rainbow trout on nearly his first cast into the river above the swimming area. The Department of Fish and Game regularly stocks this part of the river. Now that I’ve gotten you excited about swimming here, remember that all outdoor recreation carries certain risks with it. Swimming is safest in protected pools without strong currents. Currents may not always be visible to the naked eye, so investigate carefully. Only jump into water if you have carefully ascertained that there is enough depth to do so, and never dive off a rock or cliff. If you are not a strong swimmer, wear a life vest to help you float. “Water wings” and other flotation devices for children are also strongly recommended, even if they have strong swimming skills. Most people enjoy swimming in natural pools without any real danger, but every year a few people die from making bad choices. I write all of these warnings because my goal is to help people make fun memories in the great outdoors and to prevent further tragedies. The outdoors provides millions of opportunities for recreation, relaxation, physical challenges, and bonding among family members and friends. Get out and have a great time, just don’t forget safety in the process. Swimming in developed, popular areas like Rainbow Pool provides an added degree of safety and a bit more peace of mind for Mom! Popular with residents of Modesto and Turlock, this park is surprisingly close to Merced and offers a lot of recreational opportunities and facilities. Reservoir Road (accessed from Highway 132) between Waterford and La Grange. The Mid-Valley Water Ski Club holds events throughout the year for people of all ages and abilities. http://www.midvalleywaterskiclub.com/ for more information. The Yahi Bowmen Archery Club operates the reservoir’s archery range. Guests are welcome and regularly-scheduled activities are offered for people of all ages and abilities. https://www.facebook.com/YahiBowmenModesto for more information. Like the other Merced River Parks, McConnell has a lot of shade. It’s also a bit more developed than Hatfield and further from the highway. If I were to pick a Merced River park in the Valley to camp at, this would be it. Fishing can be good at McConnell Recreation Area. Rainbow trout and bass can be caught in the spring; catfish and perch throughout the year. No boating ramp is provided, but it is possible to swim in the river or to launch a float tube or hand-carried boat. Undeveloped Great Valley Grasslands State Park has a six mile hiking trail.